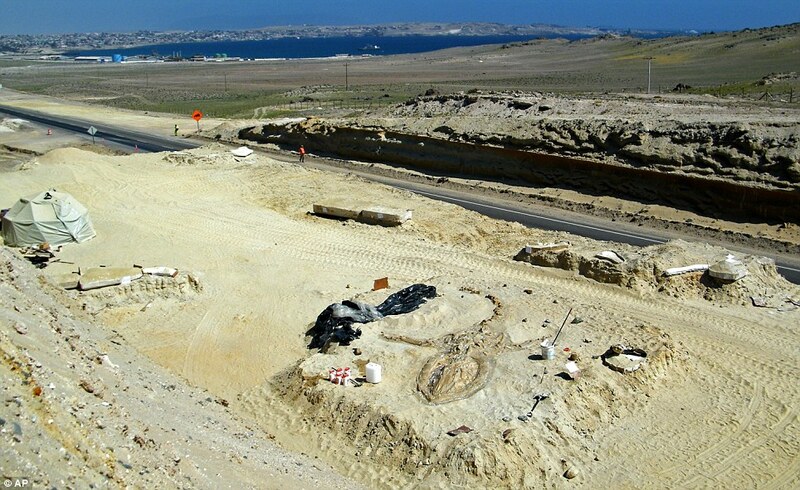 In this Aug. 24, 2010 photo released by Chile’s Paleontological Museum of Caldera, a prehistoric whale fossil lies in the Atacama desert near Copiapo, Chile. A story of a spectacular whale fossil find in the Atacama desert of Chile has recently been reported. The best pictures of the site can be found HERE along with the story. In the picture here you can clearly seen the outline of a baleen whale (like a bowhead or blue whale). There are likely hundreds of whale skeletons in this area though this particular spot is notable in the number in close proximity. You can see a bay off the Pacific Ocean in the background which gives you an idea of the elevation of this site. Creationists have claimed this is a great mystery because of the number of whale fossils in one location all together and above sea level. First it should be noted that the rock the fossils are found in is diatomaceous earth which is rock which consists of high numbers of diatoms. Diatoms are single-celled algae that produce silicon walls and thus are very easily preserved. They are found in fresh water and salt water but large deposits are usually associated with shallow ocean basins where diatoms “bloom” in the waters above and die with the silicon “shells” falling to the ocean floor. If whales died and their bones are resting on the ocean floor then diatoms could accumulate and bury the bones creating a glass tomb for the bones while they fossilize. In the situation here there is a layer of diatomacious earth covering this region that is filled with whale, dolphin, seal and other fossil bones. While young earth creationists are claiming this is the result of whales being trapped in a global flood. These bones suggest the opposite. Underneath them are thousands of feet of sediments and then near the very top is this layer of diatoms which would only collect in thick layers like this where there was relatively placid water above and falling diatoms rather than mixed up sediments being deposited quickly. The fact that all the whales in the same layer of rock across this area also suggests a particular incident in some period of time rather than whales being caught in a large global catastrophe that is laying down all the layers of rock at the same time. One other point to make here. The whales, dolphin and seal fossils found her are all fossils that appear very similar to modern-day marine mammals. Young earth creationists barminology (the study of “kinds”) has often suggested that whales all evolved from a couple of original whale kinds and that the diversity today is the result of diversification (ie. very fast evolution except they don’t call it evolution) of those original kinds into the new environments that existed after the flood (like arctic whales and deep-sea whales). That these fossil whales look like modern whales I would think should give the bariminologists pause with respect to saying that these whales were caught in a global flood because these are presumably highly adapted/evolved whales rather than the original kinds of whales which were smaller and had more leg bones etc… Just another example of inconsistencies within the creationists literature. Frequently theories are put forth to explain one piece of evidence without considering the impact on other theories within their own worldview. UPDATE (Nov 27): After doing some more reading it does sound like these whales probably died around the same time and so this is a mass death site. However, the finding of their being in a soil with many diatoms also suggests a possible cause I have not seen suggested as yet. If they were cut off in a small inlet a large algal bloom (red tide) could have toxified the waters leading directly to a mass death of whales, dolphins, sloths and birds that are also found at the same site. Any large depositional events like a large storm following that event could have covered them up leading to what we see today. Absolutely fascinating. I read about this a while back when it first came up. Have you seen any updates on this find?